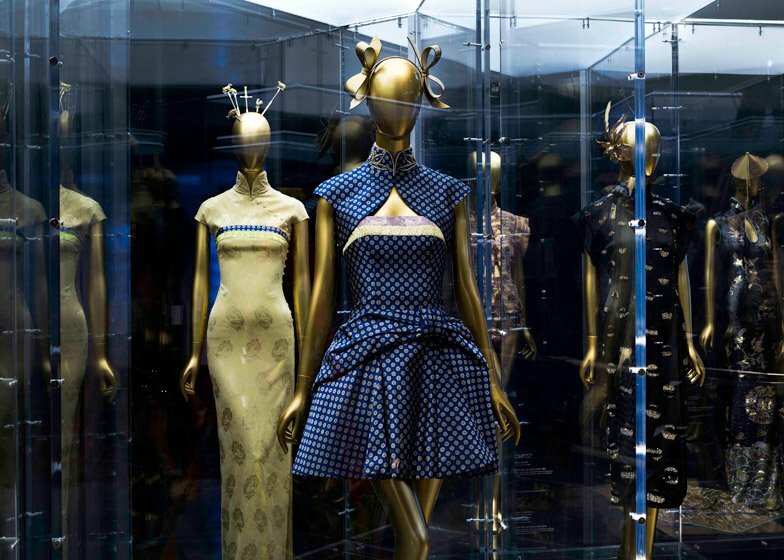 The influence of Chinese culture on fashion design is examined through garments by Alexander McQueen, Yves Saint Laurent, John Galliano and more in an exhibition at New York's Metropolitan Museum of Art (+ slideshow). 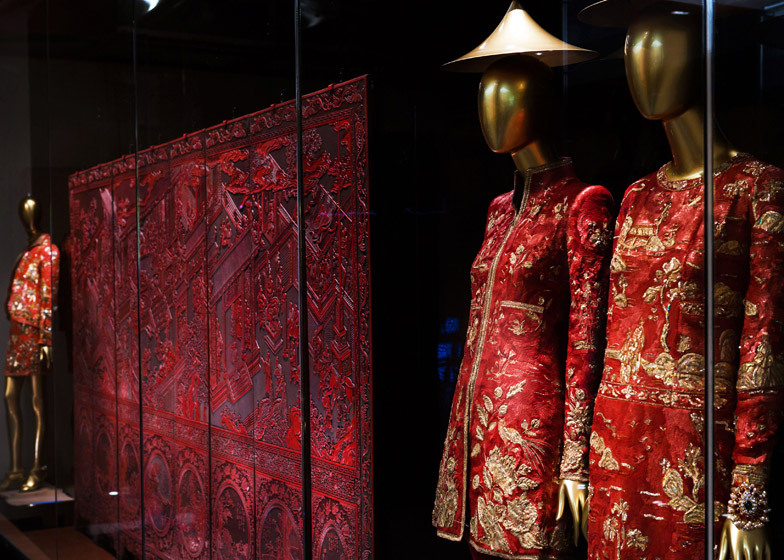 Organised by the Costume Institute, China: Through the Looking Glass is presented across the Met's Chinese Galleries and Anna Wintour Costume Center. 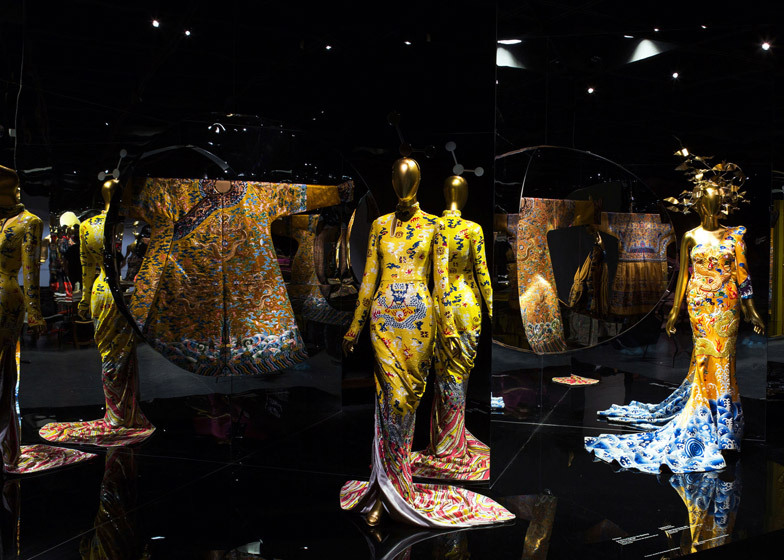 The museum's first exhibition spanning two departments since 2006, it includes 140 examples of haute couture and ready-to-wear garments, which are displayed against traditional Chinese costumes, paintings, porcelain and other artefacts. The show aims to present the influences of these cultural objects – ranging from early Imperial China to the 20th-century Communist era – on contemporary fashion, from colour and form to decorative patterns. 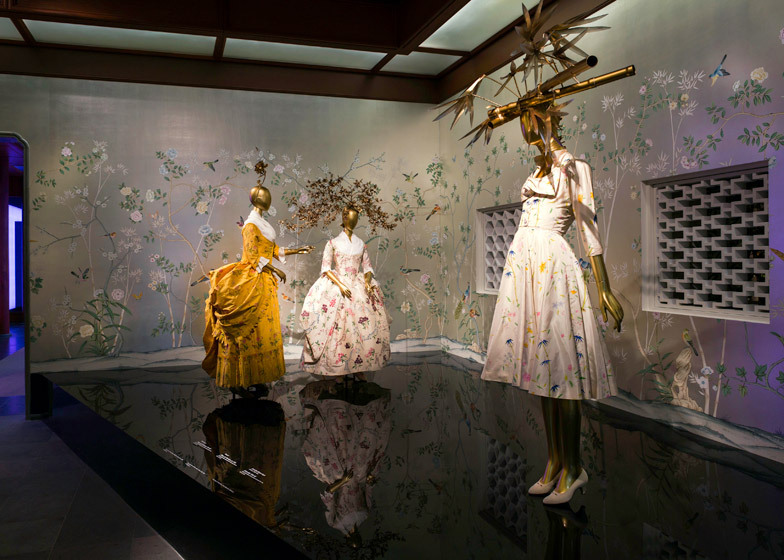 "From the earliest period of European contact with China in the 16th century, the West has been enchanted with enigmatic objects and imagery from the East, providing inspiration for fashion designers from Paul Poiret to Yves Saint Laurent, whose fashions are infused at every turn with romance, nostalgia, and make-believe," said Costume Institute curator Andrew Bolton. "Through the looking glass of fashion, designers conjoin disparate stylistic references into a fantastic pastiche of Chinese aesthetic and cultural traditions." 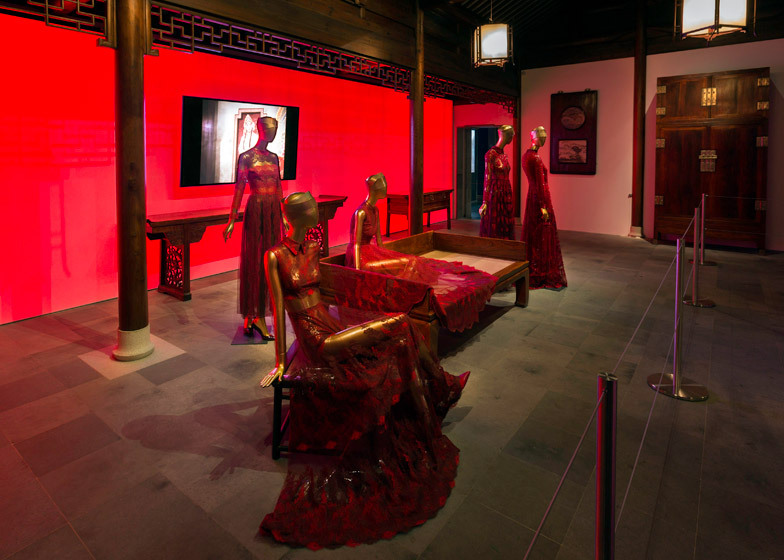 The exhibition was art directed by filmmaker Wong Kar Wai and styled by William Chang, and is laid out as a "cinematic experience". "Historically, there have been many cases of being 'lost in translation' – with good and revealing results," said Wong. "As Chinese filmmakers we hope to create a show that is an Empire of Signs – filled with meaning for both East and West to discover and decipher." 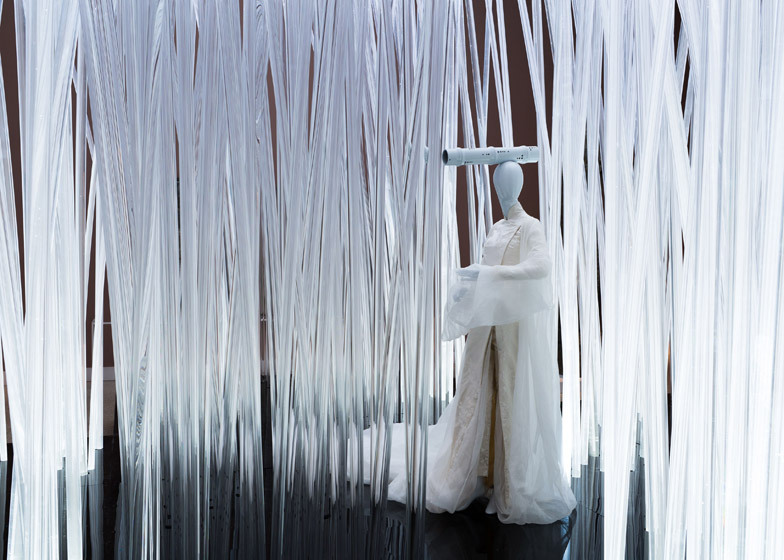 At the entrance to the galleries, transparent glass tubes lit from below create the effect of a bamboo forest in which garments from British designer Craig Green's Spring Summer 2015 collection are displayed. The 2004 film House of Flying Daggers, which features fight scenes in bamboo groves, plays on a screen behind. Each room on the upper floor is dedicated to a particular influence. For example, dark red gowns are grouped in a space surrounded by rosewood furniture. 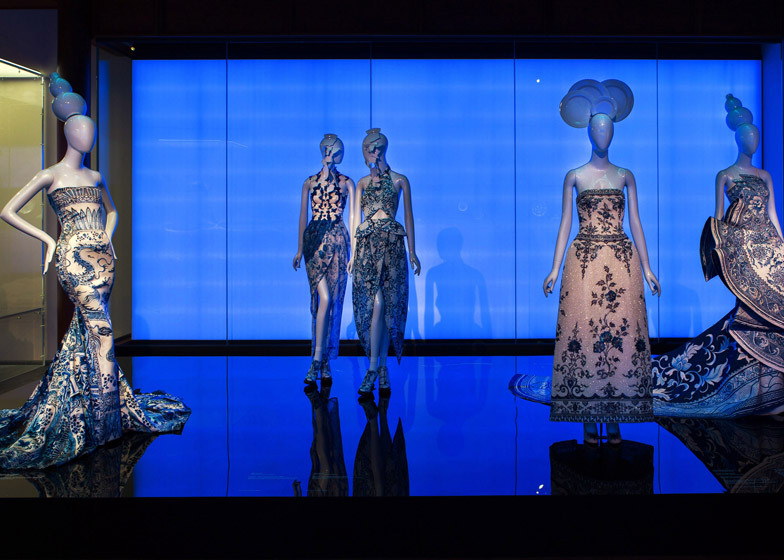 In another area, mannequins wear garments printed and embroidered to look like the intricately decorated blue and white porcelain that has been used in China since the Tang Dynasty. The figures also sport headdresses made from sections of broken plate patterned in the same style, designed by milliner Stephen Jones who created all of headpieces that feature in the exhibition. Further rooms show the influences of calligraphy, scent and painting, all within environments designed to reflect each medium. Downstairs, one room is dedicated to interpretations of the Qipao – a form-hugging dress with a distinctive high neck and buttoning that became popular in 1920s Shanghai. Also on display are variations of the khaki green Zhongshan suit worn by leaders of the Communist party, which took control of the country in 1949. The outfit is also known as the Mao suit after the first chairman of the People's Republic of China. Screens in the connecting spaces present clips of women who helped to proliferate images of Chinese style in the western media, including Butterfly Wu, Madame Wellington Koo and Madame Chiang Kai-shek. The exhibition includes a range of pieces from Yves Saint Laurent's Autumn Winter 1977 Chinese and Opium haute-couture collection, and a selection from John Galliano's time as creative director at Dior. Works by Cristobal Balenciaga, Roberto Cavalli, Coco Chanel, Jean Paul Gaultier, Valentino Garavani, Jeanne Lanvin, Ralph Lauren, Christian Louboutin, Martin Margiela, Alexander McQueen, Dries van Noten, Paul Smith and Vivienne Westwood are among the others on show. China: Through the Looking Glass continues until 16 August 2015.